Current Pre-sessional students had a busy and varied Tuesday last week when they took part in the Student Success Festival Speed Meet event and asked many questions of the staff and students who were the experts waiting to share their skills and knowledge. 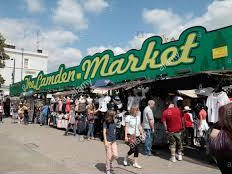 Later, on the same day students travelled together on the Tube and enjoyed a visit to the vibrant and busy Camden Market. Both events gave the students plenty of opportunity to practise their English language speaking skills as well as experiment with their fashion styles!